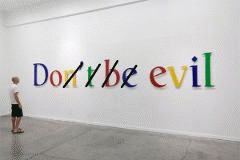 Up to about 2006 or 2007 Google provided an excellent search engine. It then started to prioritize and present more general results even where one searched for very specific information. It became cumbersome to search for and find details. The situation has since further deteriorated. The Google News search is now completely useless. It delivers the main stream media trash without showing divergent views or opinions. What is the use of a search result page that links to twenty sites with the same slightly rewritten Associated Press story? Google's algorithms now amount to censorship. Since August it downgrades websites that offer alternative views to the left of the pack. Searches that earlier led to the World Socialist Web Site or to Media Matters no longer show these sites, or show them way down the result pages. Traffic to these sites collapsed.